Carla: Well, well. What have we here? Darla: Looks like someone here is unclear on how things are run in this town, boss. Carla: You mean someone doesn't know that this is OUR department store, Darla? Darla: Looks that way, boss. Carla: I'm sure these … girls … didn't mean any harm. And I'm sure they feel so terrible about trespassing that they'd like to make it up to us, don't you think so, Darla? Darla: Makes sense to me, boss. Carla: So if these ladies just hand over their new lipsticks, I think we'll call it a simple misunderstanding, right, Darla? Darla: I'm sure they'll agree, boss. Carla: [examines lipsticks.] Very, very nice, ladies. I commend your excellent taste, if not your senses of direction. Have a lovely day. Thanks! I needed some humor in my morning! Hahaha. 🙂 I do believe my mother had this pattern. The way Carla and Darla are both tilting their heads the same makes me wonder if theyre at a modern art exhibit. The Girls in Green are powerful — they wreaked damage today over at my blog, too, coincidentally! Im sorry to say the version with the pleats strikes me as being majorly dowdy…does anyone else agree? Eeeek. Something like a brown plaid fabric would make it even dumpier. From where I sit, it looks like a real Please Dont Notice Me pattern…MAYBE suitable for a substitute teacher. But maybe Im being too harsh? To me it is the top that is frumpy. Just my opinion. 😉 Yes, I mean the combination of the top and the skirt together. PS: I read in a book about French couture that Chanel was the first to sew the tops of the pleats down in a skirt like that, so the hip area was more fitted. Wonder if its true? Thanks for advocating for the poor, defenseless little skirt! If only it hadnt met that top…. Every time I visit your site, I feel like I may have had the pattern of the day! 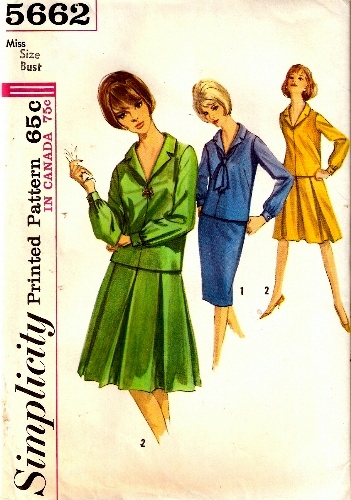 I sewed for myself and my mother back in the 60s. Taking a break from sewing to day, thought I would visit some sewing blogs. Yours is always a delight. Hilarious! Even better, my mothers name is Carla, and her best friend in college (in the 60s no less) was Darla! They searched for a Marla, but never found one.